We are indeed in exciting times as it seems that we must move mountains in order to Manage Millennial’s in today’s workforce. On a lighter note let’s not make a mountain out of a mole hill (pun intended) and see how this Generation operates and what makes them tick. The Millennial’s are a breed on their own (they are not aware of how it was like living in an era without iPads, iPhones, computers and lest we not forget Instagram). How do we Manage these techno-savvy Employees? Management must provide clear direction and goals (share the organizations vision, mission and objectives) and live the values as a Leader! Utilize Millennials in groups/team work as they collaborate and foster creativity in order to add value to your organization (team work all the way)! Let me divulge this information overshare, well to be honest I just fall out this category as I am an 84’ baby so it makes perfect sense to me even if I sit on the border line that is. 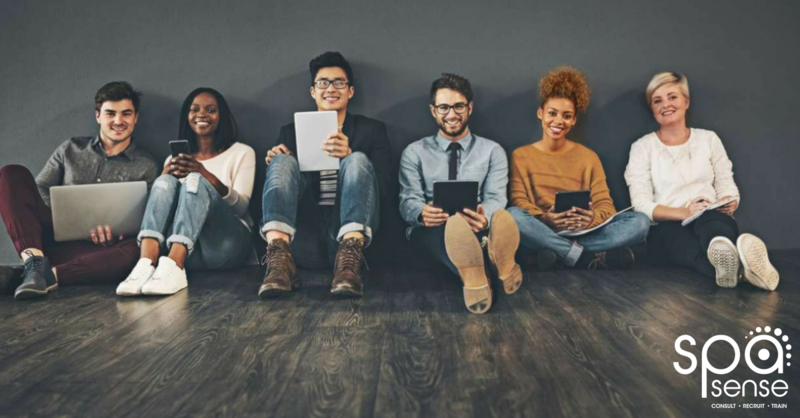 Millennial’s are very loyal and dedicated employees, however they need to feel valued, provided with regular feedback and feel that they contribute and form part of the bigger team! Embrace the young work force and take these opportunities to enrich the youth as we grow and develop these individuals. Spa Sense is here to help YOU we are PASSIONATE about PEOPLE and we WILL ensure that you Manage your Millennial’s effectively give us a call on 072-087-9633 or email leanne@spasense.co.za and we will do the rest. Let us take your HR to the next level….so you can embrace your Millennial’s and optimize your workforce. *Spa Sense will assist with Employee Induction & Orientation Program’s, Disciplinary hearings, Grievance matters, Employment contracts, Policy formulation, Performance Management, Performance Enhancement Programs, Employee Recognition Programs, Change Management, Employment Equity reports, WSP/ATR submissions, Labor Consultation & advice/support. My name is Leanne Alexander; I am passionate about people and Human Capital Management, the key driver to any successful organization. I have over 12 years of solid Human Resource experience within 5*Hotels&Spa's and a large corporate giant. After Matric in 2003, I studied at the University of Johannesburg BComm Industrial Psychology and completed my internship at the Hyatt Regency in Johannesburg for a year during 2006. I then fulfilled the HR Managers role @ Mount Grace African Pride Hotel in Magaliesburg. In 2008 until 2018 I joined a large corporate in order to accelerate my career. I have fulfilled various roles within the HR spectrum and have experience within Recruitment, Training&Development, Employee Relations, Performance Management, Change Management and overall Human Resource Management. I pursued my studies again during 2017 at Wits University to obtain an equivalent to an Honours degree in Labour Dispute Resolution Practice in order to qualify as a Commissioner. I am also a registered Assessor, moderator and SDF. I look forward to taking your organizations HR needs to the next level!